Japanese Olympic Committee President Tsunekazu Takeda attends a press conference in Tokyo on Jan. 15, 2019. The head of Japan’s Olympic Committee confirmed that he had been questioned by French authorities in December on Tuesday but repeated his denial there was anything improper about Tokyo’s bid for the 2020 Games and vowed to prove his innocence. French financial prosecutors investigating a multi-million dollar payment made by the bid committee to a Singaporean consultancy questioned Tsunekazu Takeda in Paris and he was placed under formal investigation for suspected corruption on Dec. 10, a judicial source told Reuters on Friday. Takeda told a packed news conference there were no reasons to doubt any part of Japan’s dealings with the Singaporean consultancy in connection with Tokyo’s bid and that he would cooperate fully with French authorities. 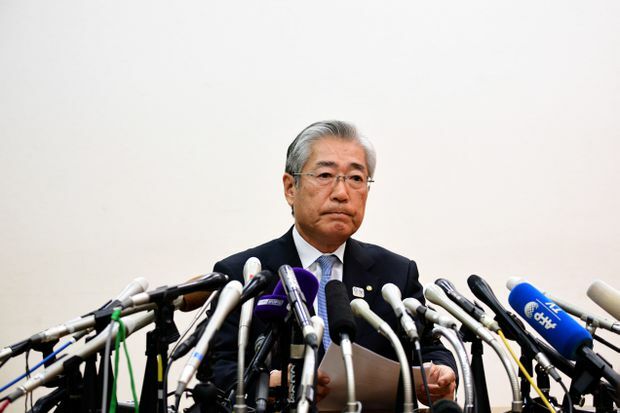 After apologizing to the Japanese people and everyone involved in organizing the 2020 Tokyo Games for worrying them, Takeda repeated denials first made on Friday that there were any improprieties in Japan’s dealings with the Singaporean consultancy. He added the contracts were for lobbying and information gathering, that the payments were as usual for such work, and noted that a 2016 investigation by a third-party committee had cleared the 2020 bid committee of any wrongdoing. “From here on in, I will fully cooperate with the French authorities and make every effort to prove my innocence,” he said. Under French law, a formal investigation means there is “serious or consistent evidence” implicating a suspect in a crime. It is one step closer to a trial, but such investigations can be dropped without going to court. French investigators have led a years-long probe into corruption in athletics and in early 2016 extended their inquiry into the bidding and voting processes for the hosting of the 2016 Rio de Janeiro and the 2020 Tokyo Olympics. Whatever the outcome of the French investigation, the news now hangs over preparations for Tokyo 2020 just 18 months out from the start of the summer showpiece. Tokyo 2020 organizers, however, moved to distance themselves from the bidding team’s activities. “Tokyo won the 2020 race because the city presented the best bid,” Tokyo 2020 spokesman Masa Takaya told Reuters in an interview later on Tuesday. “The organizing committee was established after the election so the Tokyo 2020 organizing committee has no idea to know the details of its (bidding team) activities. “There will be no impact to Games preparations,” Takaya stressed. International Olympic Committee (IOC) President Thomas Bach said during a visit to the Japanese capital in December that he couldn’t remember a host city being as well prepared as Tokyo. Takaya said there had been no “specific signals or messages” from the IOC to Tokyo 2020 organizers regarding Takeda. Prosecuting judge Renaud Van Ruymbeke now suspects Takeda - a former Olympic showjumper, longstanding Olympics official and second cousin of Emperor Akihito - of paying bribes to secure his nation’s winning bid, the judicial source said on Friday. Takeda, 71, a great-grandchild of Emperor Meiji who competed in the 1972 and 1976 Olympics, has been a member of the Japanese Olympic Committee since 1987 and its president since 2001. He has helped coordinate preparations for several Winter Olympics as a senior member of the IOC and also heads the IOC’s marketing commission. The IOC ethics commission opened a file on Takeda on Friday. This investigation is the latest blow to the governing body, which has been trying to clean up the bidding process around Olympic Games following a spate of corruption allegations and increased spending by host cities.